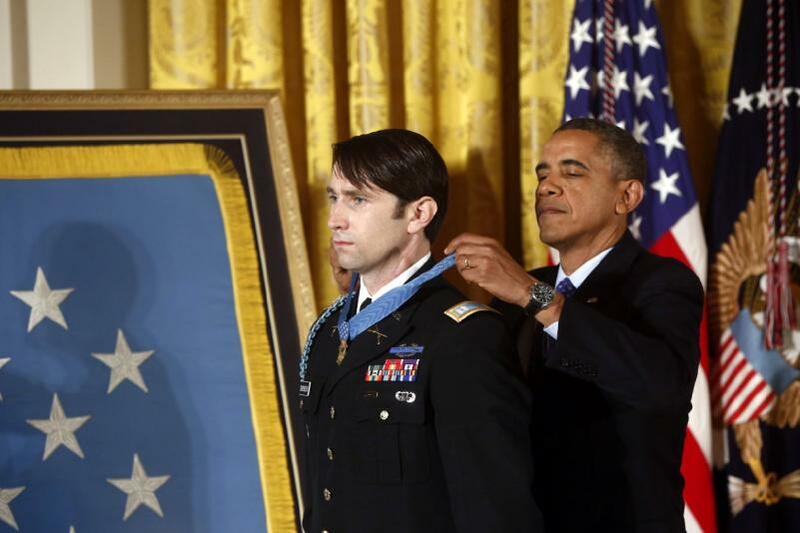 In a ceremony at the White House on Oct. 15, President Barack Obama awarded Captain William D. Swenson the nation’s highest military honor for valor, the Medal of Honor. Captain Swenson was assigned to the 3rd Brigade Combat Team, 10th Mountain Division, as an adviser to the Afghan Border Police Mentor Team on Sept.8, 2009, when both Afghan soldiers and their American military trainers were ambushed near the village of Ganjgal in Kunar Province, Afghanistan, by more than 50 Taliban fighters. Swenson is the sixth living person awarded the Medal Honor for valor in the Iraq and Afghanistan war, according to the Defense Department. Marine Cpl. Dakota Meyer was awarded the Medal of Honor by Obama in 2011 for rescuing troops that same day and recovering the remains of four Americans killed in the battle of Ganjgal and served beside Captain Swenson. Meyer in his book, “Into the Fire: A Firsthand Account of the Most Extraordinary Battle in the Afghan War” said he would not be alive today if it was not for the actions of Captain Swenson and advocated that Swenson should receive the Medal of Honor. Swenson was outspoken and critical of his superiors for not receiving timely air and artillery support. An investigation subsequently led to three Army officers being reprimanded. Swenson’s Medal of Honor was delayed when the paperwork for the award was lost. Gone but not forgotten are the four Americans killed in the ambush: 1st Lt. Michael Johnson, 25, of Virginia Beach, Staff Sgt. Aaron Keneflick, 30 of Roswell, Ga., Corpsman James Layton, 22 of Riverbank, Calif., and Gunnery Sgt. Edwin Wayne Johnson Jr., 31, of Columbus, Ga. Also killed that day were 10 Afghan troops and an interpreter. Swenson left the Army in February 2011 but has asked to return and is waiting for a decision by the Army.